The 2018/19 Russian Football Premier League season kicks off in less than a week. Following a dramatic World Cup, Russia is back to the day-to-day business of club football, and the Futbolgrad Network once again will be on the pulse of everything that is going on in what is one of the most open leagues in Europe. 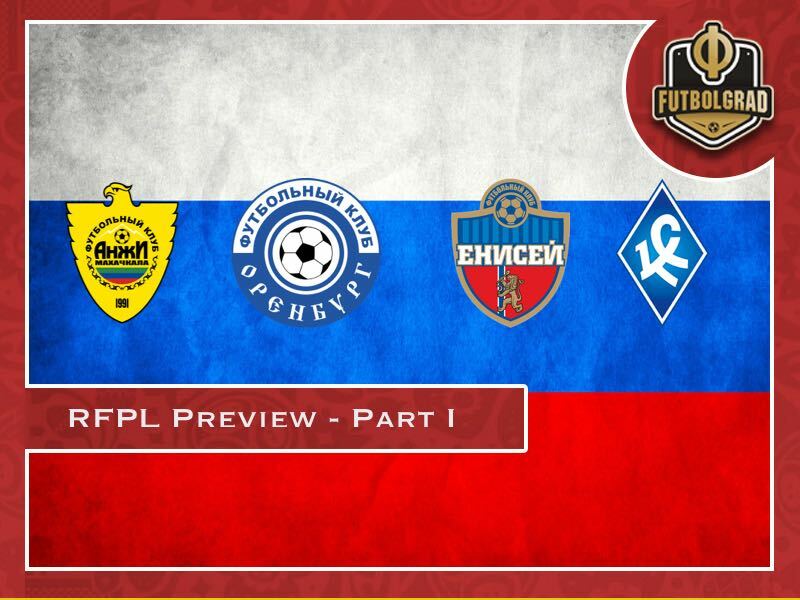 Ahead of the new season we will break down the league in four parts starting with the newly promoted teams as well as Anzhi Makhachkala. That Anzhi are still a top-flight club is little short of a miracle – or at least the result of systemic Russian football financial irresponsibility. Although the Dagestani side dropped into the relegation playoff zone where they were picked apart by Enisey Krasnoyarsk, they were saved by Amkar Perm going bust in a summer where financial strife, even by Russian football’s standards, was brutal. The start of the season saw a typically nonsensical transfer window with an eye-watering total of 61 separate deals going through – little wonder, then, that the subsequent nine months were chaotic. Vadim Skripchenko began management with a two-year spell in his native Belarus in charge of Dinamo Minsk saw Viktor Goncharenko bring him over to Russia to assist him at Kuban Krasnodar. The pair moved together to Ural Ekaterinburg in 2015, and when Goncharenko left amidst a match-fixing row involving what was then Terek Grozny, his right-hand man went it alone. A solid first season saw mid-table security before 2016-17 saw only two wins before the end of November. Having made an excuse of needing to take time off to address a serious health issue in his homeland, he resurfaced two days later as Krylia Sovetov, whom he promptly guided to relegation. His successor, Magomed Aliev, is a virtual unknown, having only taken charge of junior sides so far. Paul Anton is one of the few remaining players of quality after the expected exodus this summer. The forward’s department is so sparse that there are serious concerns about Anzhi’s ability to score, but that will be a pointless task without some control in the middle of the field. Anton’s calmness under pressure will be critical if Anzhi are to get anything from this season, and with the support of new arrival Mohamed Rabiu there is a glimmer of hope. You could look at Anzhi’s summer dealings one for two ways; it is far less chaotic with far less turnover of personnel, but the quality that has been brought in is highly questionable. There hasn’t been a striker brought in to replace top scorer Juan Lescano, and they have lost Sergey Bryzgalov to Ural. The average age of their seven permanent signings is almost 30, while only three of them have any meaningful top-flight experience. It is easy to forecast doom with Anzhi given how much of a mess they have become, not to mention their lack of previous financial backing. This time, however, it is an entirely justified prediction. Gone are what little sparks of attacking creativity with Arsen Khubulov, Pavel Yakovlev and Lescano all departing, and very little has arrived to replace them. Unless a miracle happens, and fast, it is hard to see them surviving. Orenburg have for some time been a powerful player in the lower leagues, dominating their last two FNL campaigns. Backed by Gazprom subsidiary money, it is of little surprise that they have made mincemeat of the second tier, and last season they were again crowned champions. It was telling that Vadim Afonin jumped ship from Premier League Anzhi back to Orenburg in January, and his quality was just one part of the dominance they enjoyed. With just one defeat at home and an impressive 59 goals in 38 games – scored by 19 different players – tells a story of their strengths. Vladimir Fedotov spent the majority of his playing career in Ekaterinburg at Uralmash, as ural were then known. He also forged his managerial career there, before assisting Robert Evdokimov through the maiden promotion and subsequent relegation seasons at Orenburg. His favoured approach is a cautious five-man defence, with ancient veterans Dmitry Andreev and Adesoye Adewole still holding the fort. Having also lost Artem Delkin and Duris, striking options are even thinner on the ground, so Fedotov is likely to adopt a pragmatic approach to this season. Vadim Afonin has been at the core of Orenburg’s rise to the top table of Russian football. The Uzbek international midfielder is a tall, uncompromising holding player with a surprisingly long range of passing. Rather than simply play the stereotypical bruiser in the centre of the park, he also provides a spark for counter-attacks, and will frequently be at the top of passing statistics in matches for accuracy and volume. 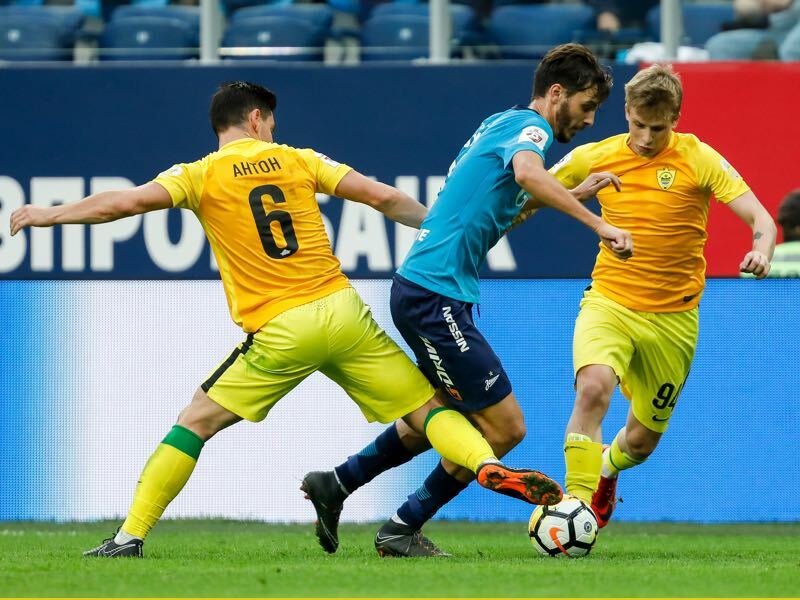 They have made a profit in their dealings so far by selling loaned-out Michal Duris to Cypriot side Anorthosis Famagusta, but perhaps their best bit of business has been securing the signature of Andrey Dovbnya from relegated SKA Khabarovsk. The keeper was one of few players from his squad to emerge with an enhanced reputation. Andrea Chukanov is an intriguing signing; he originally joined last summer on trial but was sent back to FC Tyumen where he went on to have his most mature and productive season. A former Lokomotiv Moscow youth product, Chukanov’s pace and versatility across the frontline – or even at wingback – could be an ace up Orenburg’s sleeve. They also trimmed the squad to release five players over 30. With their backing, and experience through the defensive areas of the team, they have a reasonable chance of survival. Questions have been and will continue to be, asked about their backing from Gazprom after an agreement was signed a few years ago between the company and Orenburg region, but for now, the club are in with a very strong shout to stay up. Sergey Kornilenko once again led Krylia’s front line by top scoring as they powered through to promotion for the second time in three years. His partner in crime was Aleksandr Sobolev, who had a taste of Premier League football 18 months ago at struggling Tom Tomsk, and managed a creditable 14 goals, one fewer than Kornilenko. They boasted the tightest defence in the league, conceding just seven at home in 19 matches, while only Enisey Krasnoyarsk scored more. In fact, they recorded 24 clean sheets in the league alone. Andrey Tikhonov comes with a huge reputation as both a player and an emerging manager. A multiple title winner under the legendary Oleg Romantsev as a player, he also turned for his current employers for five years among a host of other shorter spells at other clubs. After his final professional appearance at the age of 40, he remained at Spartak for four years as assistant manager and academy coach before assisting Oleg Kononov at Krasnodar. Two years ago he finally went it alone and guided Enisey Krasnoyarsk to their best-ever league position of third in the FNL, but failed to make it through the promotion playoff. Last season, he went one better with Krylia. Aleksandr Sobolev has real potential to become a dangerous weapon in Krylia’s attack if he can be guided carefully. In the aging Kornilenko and Maksim Kannunikov, he has two solid role models, but with his potential, he could become much more than just a support act. It is likely he will partner Kannunikov for the majority of the campaign given the captain’s advancing years, and with a few early goals to boost his confidence he can provide a much-needed focal point for Krylia. Surprisingly, Krylia let three senior centre-backs go without replacing them. Trinidad and Tobago international Sheldon Bateau spent last season on loan alongside Andrei Arshavin at Kairat in Kazakhstan and has made his move there permanently, while Ali Gadzhibekov has reinforced promotion rivals Enisey Krasnoyarsk, and Ivan Taranov has joined Krasnodar’s second team. Kannunikov is the major incoming transfer and will offer another option up front, but otherwise, they have been conservative in the market so far. Krylia won’t pull any trees on their way through this upcoming season, but there is enough of a spine to give survival a decent shot. Tikhonov has proven himself to be an excellent organizer, and with a couple more signings to complement the current crop, they should be able to steer clear of the automatic relegation places. Finishing third for the second successive season, Enisey must have worried at having to negotiate the promotion playoffs again having fallen at this stage last season. However, they had little trouble putting six goals past Anzhi over the two legs and looked confident doing so. They were by far the highest scorers in the division, scoring two goals a game at home, and under Dmitri Alenichev, they have developed an attacking philosophy. Dmitri Alenichev has had a bizarre managerial career so far. An undisputed legend on the pitch at Spartak Moscow and abroad as a Champions League winner with Porto, he was guaranteed status when first applying for managerial positions. Russia under-18s were followed by a fruitful three and a half years at Arsenal Tula, where he earned them a promotion for the first time in their history. Finishing rock bottom of the top flight didn’t prevent his former club Spartak from appointing him, but it ended poorly and he was sacked at the end of the 2015-2016 season. His intent to play attractive football saw Enisey Krasnoyarsk take a punt on him, and he dragged them into the Premier League at the first time of asking. Fegor Ogude has a wealth of top-flight experience to steel the midfield after joining from Amkar Perm. The Nigerian international holding player has been in the Premier League since 2014 and has built a knowledge of the level that will prove invaluable. Although the recruitment has been solid this summer, Enisey are still breaking new ground with promotion and will have to battle their way to some results – who better to have than Ogude? After the collapse of Tosno and Amkar Perm, it was inevitable that their squads would be picked apart by the circling vultures. That five Amkar players alone flocked to Alenichev’s banner speaks volumes for the manager’s reputation and the hope of establishing a Premier League club in the east. Petar Zanev, Darko Bodul, Pavel Komolov and Mikhail Kostyukov are joined by Tosno keeper David Yurchenko and centre back Rade Dugalic, while Denis Terentyev, Aleksandr Zotov and Alexey Gritsaenko all arrive on loan. Ten players have been shipped out; in essence, a whole top flight team has been airlifted in. With the extensive recruitment and Alenichev’s momentum, it is hard to see Enisey struggling to survive. The massive journey times may not be as manic as those to Khabarovsk last season, but they are significant enough to cause consternation to the established Premier League outfits. One downside is that they will have to play at least their first two home games in Tyumen while their stadium is redeveloped. It is hard to see them going straight back down. Andrew Flint is an English freelance football writer living in Tyumen, Western Siberia, with his wife and two daughters. He has featured on These Football Times, Russian Football News, Four Four Two and Sovetski Sport, mostly focusing on full-length articles about derbies, youth development and the game in Russia. Due to his love for FC Tyumen, he is particularly interested in lower league Russian football, and is looking to establish himself in time for the 2018 World Cup. Follow Andrew on Twitter @AndrewMijFlint.